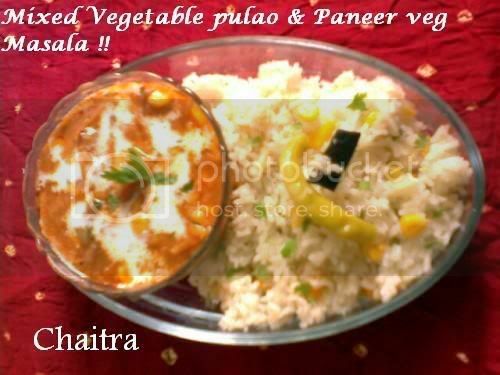 I am back with another combo Mixed veg pulao and Paneer veg masala (Paneer butter masala recipe loaded with veggies).Make your Sunday lunch delicious with this killer combo!! Heat this oil-ghee mixture in a pressure cooker and fry cloves,cardamom,cinnamon stick and fry for few mins,now fry cashew nuts until golden brown and then add all veggies,green chillies, including sweet corn .Now add salt.Cook for few mins.Now add rice, water and coconut milk and pressure cook.After 3-4 whistles off the flame.Remove.Mix all the ingredients well and adjust salt if necessary (add salt water instead of salt).Transfer the contents into a serving bowl. Now lets come to Paneer veg masala cury's story. 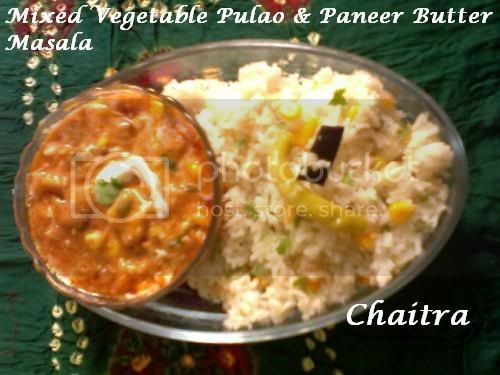 This is paneer butter masala recipe loaded with veggies. Heat oil in a kadhai and fry cloves and cardamom. Now add onions and fry until translucent,add tomatoes,turmeric powder and red chilli powder and fry. Add veggies and cook for sometime.Meanwhile heat oil in another kadhai and fry paneer cubes until golden brown in colour and keep it aside.Grind cashew nuts and poppy seeds into a paste and add it to the kadhai with veggies. Now add water, then salt and cook until you get the required consistency.Finally add paneer and butter.Mix all the ingredients and adjust salt if required.Transfer the contents into a serving bowl.Garnish with chopped coriander and cream. Now you can serve this killer combo to your loved ones. NOTE-Adjust ingredients as per your taste. 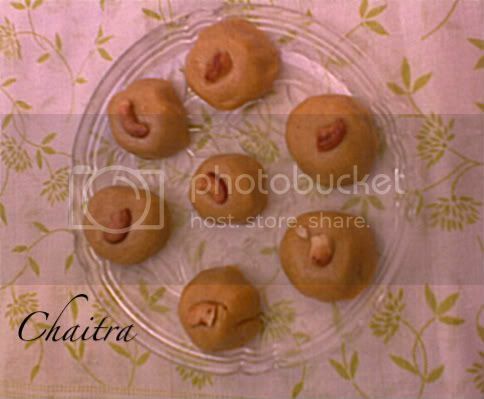 First of all i would like to ask you all about the cool new and refreshing look of Aathidhyam.Also would like to thank my friend Sandhya who gave me useful blogging tips and her valuable suggestions. Now all is well (New song from 3 idiots). I mean i wrote my exams very well and expecting 84-89% and i thank all my readers for their good wishes and support. Take a thick bottomed kadai, heat ghee and fry besan flour till roasted. Keep stirring. Off the flame.Now add powdered sugar, ghee if required and nuts. 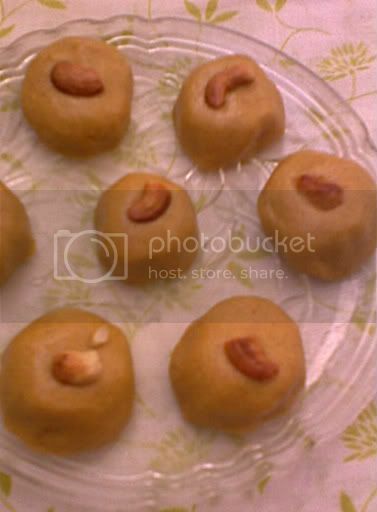 Shape this mixture into round balls and garnish with roasted nuts. 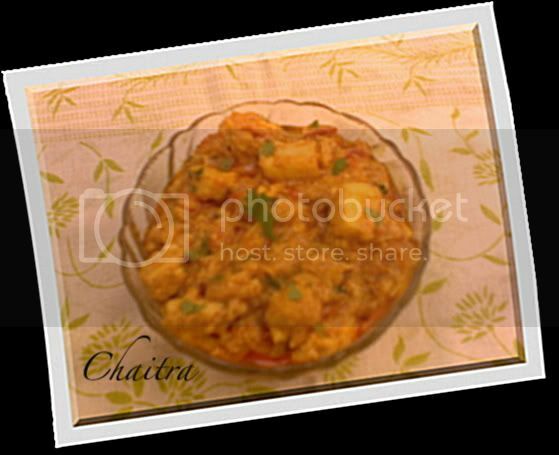 My Mom tried Nag's Paneer Butter Masala recipe.It was rich,creamy and tasted great. Thank you Nag's for sharing this recipe!! !